While a post-doc at UC Davis, I led the software development effort for the IDAV Landmark Editor in conjunction with my advisor Nina Amenta and colleague Eric Delson at Lehman College, NY. 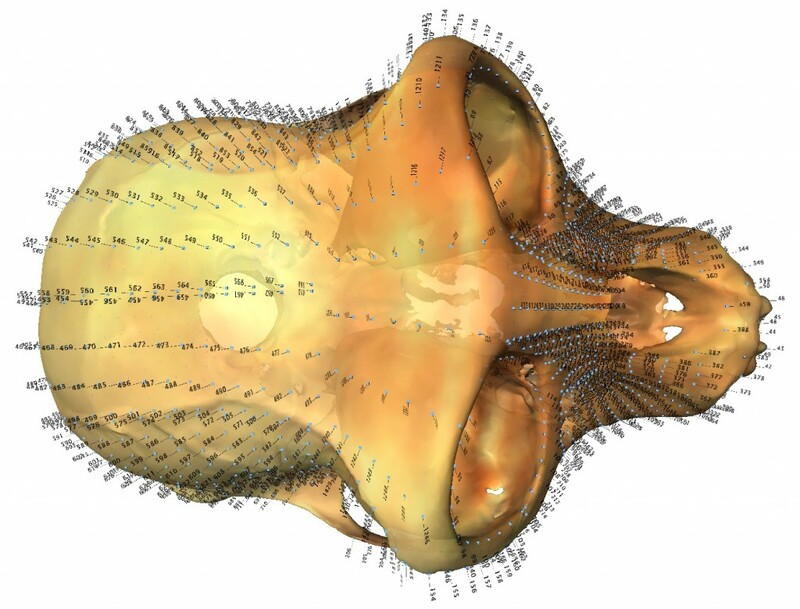 Landmark was the result of three years work in an effort to improve landmark point collection for shape analysis, geometric morphometrics, statistical analysis, and evolutionary tree visualization for physical anthropology. I observed Will Harcourt-Smith at the American Musuem of Natural History while he collected landmark points on various laser-scanned fossil specimen using conventional software tools. The idea was to collect as many 3D landmark points as possible in as short of time as possible. Prior to this software, anthropology researchers would place single 3D points on biologically relevant landmark points. To improve the process of placing single points, we added the concept of placing a curves and/or patches of semi-landmark points on specimen surfaces to dramatically increase the density of points collected. With these new primitives implemented in the Landmark Editor, we were able to improve collection rate from hundreds of 3D points per hour to thousands of 3D points per hour by improving the landmark collection process. This allowed an order of magnitude improvement in efficiency and 3D shape representation. The software has been well-received by anthropology researchers world wide. IDAV Landmark Editor with 1000s of landmark points. However, as with any good research project, the NSF funding eventually subsided leaving the Landmark Editor software on it’s own, the original project page is here Landmark Editor Project Page, however, UC Davis no longer supports downloading the software. Since then, as a way to continue providing 3D software tools to anthropology, the security industry, and the healthcare industry, I founded Stratovan Corporation. Our first product was Stratovan Checkpoint, which is essentially the “new version” of the Landmark Editor. Checkpoint has all the landmark collection capabilities as the Landmark Editor and more. If you have been using the Landmark Editor, I encourage you to take a look at Checkpoint as a replacement. Feel free to contact/email us if you have any questions on how to transition from the Landmark Editor to Checkpoint. I need to do retrodeformation, Stratovan´s Checkpoint can do it?